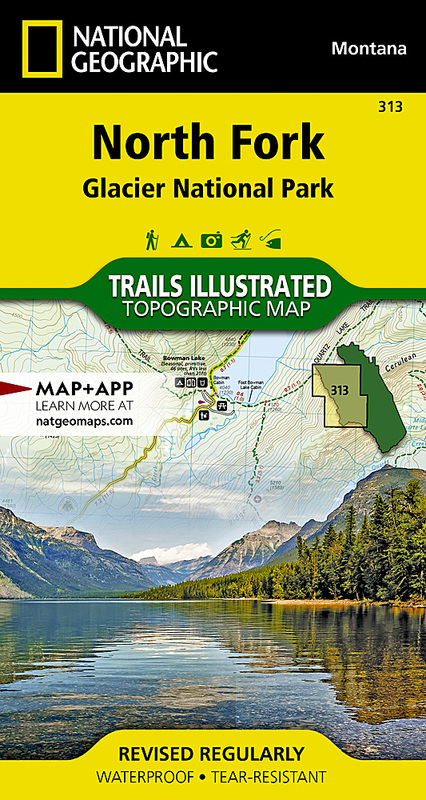 National Geographic's Trails Illustrated map of North Fork in Glacier National Park will benefit even the most experienced outdoors enthusiast, as you explore this pristine landscape that has very few amenities. Two additional maps for Many Glacier and the Two Medicine regions of the park along with a comprehensive Glacier National Park Trails Illustrated map are also available.Created in partnership with the National Park Service, U.S. Forest Service and others, this expertly researched map features key areas of interest such as Bowman Lake, Lake McDonald Valley, Goat Haunt and Avalanche Creek. The North Fork map is an invaluable resource for exploring the mapped trails of the area, including the Pacific Northwest Trail, the Continental Divide Trail and recommended biking trails. The map base includes contour lines and elevations for summits, passes and major lakes. Charts of unbridged stream crossings as well as seasonal plank and suspension bridges will also aid in your navigation of the area. Recreation features are clearly marked, including campgrounds, backcountry campsites, trailheads, interpretive trails, fishing and boat access and horse rental locations. A variety of helpful information about recreation activities available in the park, backcountry hiking and camping, regulations, and safety tips is included as well. Other features found on this map include: Apgar Mountains, Bowman Lake, Flathead National Forest, Glacier, Kintla Lake, Lake McDonald, Lewis Range, Livingston Range, Mount Carter, Mount Cleveland.